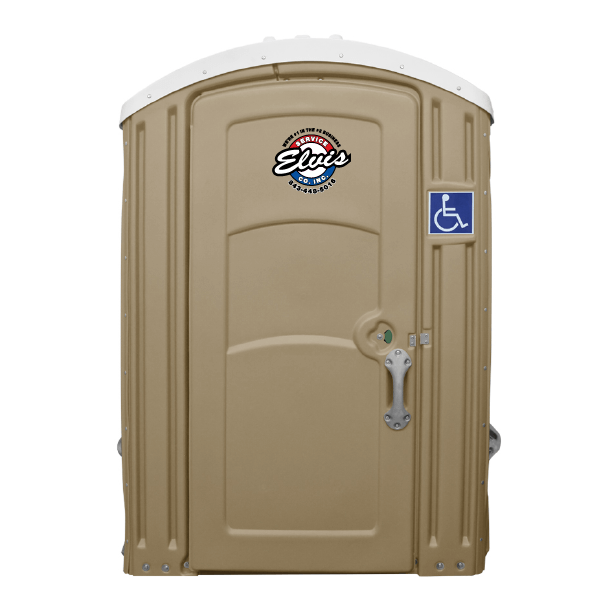 The ADA Handicap , an Americans with Disabilities Act (ADA)- Compliant portable restroom, and the Regular Handicap provide Elvis Service customers the opportunity to serve their special needs customers with the highest level of products available. The ADA Handi-Capped utilizes the T-Turn option under ADA guidelines which allows for a more compact, more easily transported special needs un it. The regular Handi-Capped, while successfully used by special needs patrons both in and out of wheelcharis, is a smaller lighter weight unit than the ADA Handi-Capped. Both units come standard with heavy-duty brushed aluminum handrails and pneumatic door closers installed to provide the highest ease of use of any handicap accessible unit on the market. Both units are also constructed on flat floors eliminating the needs for bulky ramps. 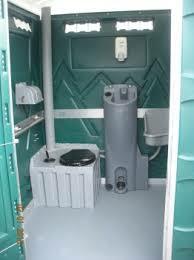 If you have a special event, wedding, or job site that requires large porta potties for weelchair access, we will gladly provide you with monthly rental prices in Myrtle Beach, Florence, and Wilmington. 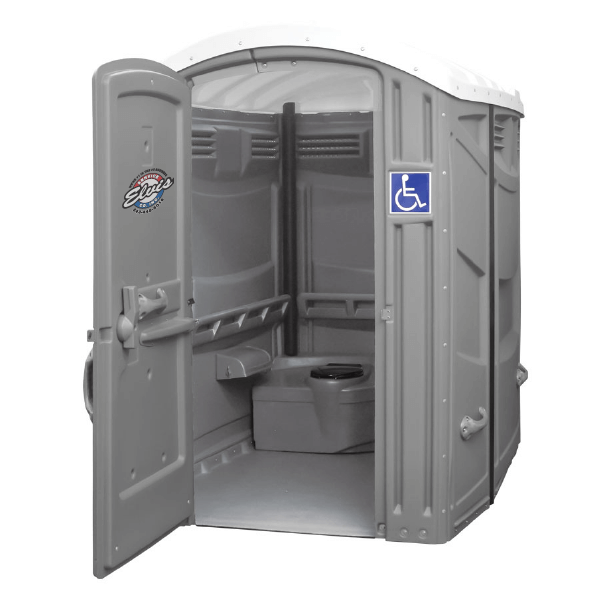 Our Handicap accessible portapotties are large enough for wheelchair access and compliant with ADA regulation for portajohns. The ADA Handicapped is the ideal choice to use when full-service, full compliance restrooms are required. Under ADA Guidelines, the T-Turn option requires less space than a full-turn radius that resulted in the larger, clumsier ADA-compliant units of the past. The unit is easier to transport and place than any of its predecessors. The ADA Handi-Capped includes full width handrail assemblies that overlap most corners, adding strength and rigidity to the unit. A pneumatic door closer is balanced by a heavy-duty cable spring for comfortable, consistent and predictable access. The Regular Handicapped unity provides convenient access for persons who prefer a large portable restroom, and it has been successfully used by patrons in wheelchairs, though it is not ADA-Approved. The Regular Handi-Capped, like the ADA Handi-Capped, includes full width handrail assemblies that overlap most corners, adding strength and rigidity to the unit. A pnuematic door closer is balanced by a heavy-duty cable spring for comfortable, consistent, and predictable access.